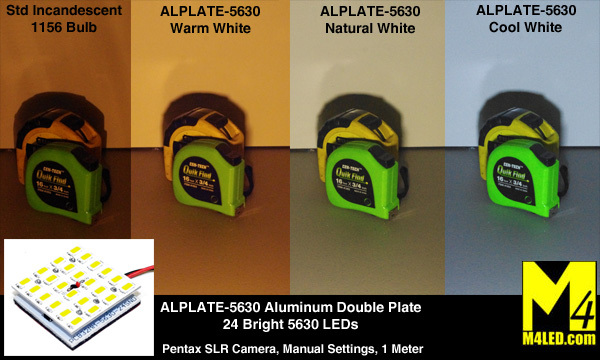 Click the button below to add the ALPLATE-24-5630-CW Cool White Double Aluminum Plate to your wish list. Very Sticky Foam Adhesive tape is preinstalled. You need a relatively flat 1.25" x 1.25" area to adhere them to. 24 Bright Samsung 5630 SMD LED chips pointing right in the direction you need them. This part number is for Cool White 6000k Color. If you prefer Warm White 3200k, choose part number ALPLATE-24-5630-WW, or Natural White 4500k part number ALPLATE-24-5630-NW. See the image below the Specifications for actual color and output pictures. Bright, reliable and fairly priced...what more do you want? I've bought a number of LED double plate lights from M4 over the last couple of years and they have all been the cool white LEDs and all have been brighter than expected, reliable and priced fairly. The two types of bulb base adapters included with the 'bulbs' have been useful, altho' in my applications, I have generally hard-wired the LED plates in place, but it's nice to have the other option. The sticky adhesive backing has worked in every case but one, and that was easily fixed with a little Gorilla Glue. I'll be buying more from M4. You should too! Communicated with a REAL person! Great info and company. Plate lights easy to install and they lit up the dark hallway. Called and talked to a real person, described my current lighting setup and we found possible solution to replace burned out units. The lights fit great, very bright and I will be changing out all of the walkway lights to these bright more reliable sets. Wanted to change out the old style 921 wedge type bulbs in my RV. The wedge type LEDs were about same output as the old ones. The pancake type leds were rated at more Lumes and smaller. They stick to the fixture and work great. I had enough room left to put a small led wedge type bulb in other socket on light. It really made things brighter and they do not get hot. I ordered two of these units to replace my porch lights on my 5th wheel. The installation went well, I inserted a small piece of tapered molding behind the led board to angle & face the board down. I have changed out all of my interior light fixture bulbs to LED's and I use these bulbs in all of my ceiling and under cabinet locations. I even changed out the range hood light with these. They are a super bright and very white light that is perfect for reading. They mimic the light from the sun so colors are bold and sharp with great contrast. The price is less than half than from other vendors selling similar items. These are by far the best in the market today and this vendor offers prompt shipping. Quality product, quality company ! Very nice light and built well. Re-lamped all the interior lighting in a '71 Airstream with LED's from M4Products. Couldn't be happier. The socket was rusted completely out for the exterior door light so I wired 2 of these in. Looks great! I then used 3 each of these inside the circular fluorescent fixtures. I just removed the bulb and used the existing switch. These look great!